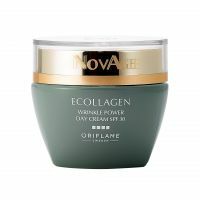 NovAge Day Shield SPF 50 UVA /PA++++ Advanced Skin Protector is a multi-protection cream designed to shield the skin from external aggressors in three ways and help to slow down ageing signs for a radiant, clear and even complexion. SPF 50 provides high protection against burning UVB rays, while UVA/PA++++ (the highest level of PA protection) defends the skin against the ageing effects of the sun, such as uneven skin tone, dark spots and wrinkles. Contains Pollution Protect Technology to minimise the negative impact of environmental aggressors such as pollution, by working like a second skin, forming an ultra-fine protective film on the skin’s surface. With Anti-Ageing and Moisturising actives to add moisture and relieve the skin from dehydration. Also contains Vitamin E, a powerful antioxidant to help protect the skin from free radicals, a major skin-ageing factor. 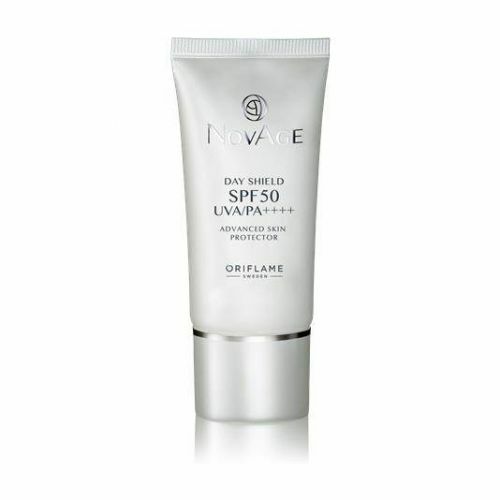 NovAge Day Shield SPF 50 UVA/PA++++ Advanced Skin Protector provides the complete daily defence for skin, so now you can look younger for longer. Apply onto face and neck in the morning after your day cream. Can be re-applied throughout the day for maximum protection. Avoid direct contact with eyes. 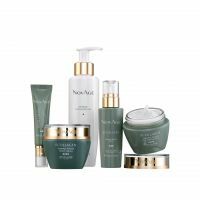 A perfect complement to your NovAge skincare routine. Broad Spectrum UV Filters – The high SPF protection is achieved through the UVA and UVB filters that help to protect skin from harmful rays. UVA rays are the main contributors to premature skin ageing and PA++++ is the highest level of UVA protection available to help prevent uneven skin tone, dark spots and wrinkles appearing and becoming deeper. Pollution Protect Technology – Helps to minimise the negative impact of environmental aggressors such as pollution. This technology works like a second skin, forming an ultra-fine film on the surface of the skin that shields it from the surrounding environment. Anti-Ageing & Moisturising –infused with actives to give moisture back to the skin and protect it from dehydration. Also contains Vitamin E, a powerful anti-oxidant to help protect the skin from free radicals, a major skin ageing factor.